Anna Matous lived life to the fullest before returning home peacefully to the Lord on October 18,2005 after a struggle with Alzheimer’s disease. She was 91 years old. Anna was born on January 25,1914 in Butler, Pennsylvania. On September 10,1934 she was united in marriage in Pittsburgh, Pennsylvania to Joseph Matous. He preceded her in death on June 23,1977. In 1981, she moved to Port Washington to be near her children and grandchildren and joined the community. There were so many things in life that Anna enjoyed including crocheting – making afghans and baby blanket/sweater sets for family and friends; volunteering as a Pink Lady at St. Alphonsus Hospital, playing bingo, reading, taking walks and traveling to visit her daughter in California. 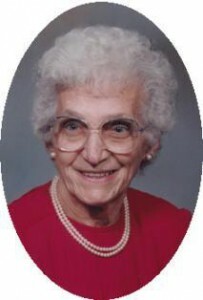 In her late eighties her greatest joy was babysitting her great grandchildren. In 2000 Anna was honored when her namesake, Ann Laura, was born to her great-granddaughter, Karen Mallow and her husband Joe. She is survived by her three children, Joan (Thomas) Doyle of Port Washington, Joseph (Margaret) Matous of Port Washington and Mary Anne Walsh of Newport Beach, California. 11 grandchildren, 14 great grandchildren and 1 great, great grandchild further survive her. Anna loved life and people. Her smile and kind heart will never be forgotten. She touched our lives and will greatly be missed by family and friends. A Mass will be held in Pittsburgh, Pennsylvania where she will be interred alongside her husband at Resurrection Cemetery . A Memorial Mass will be held 11 am Friday, November 25, 2005 at St. Mary’s Church in Port Washington.